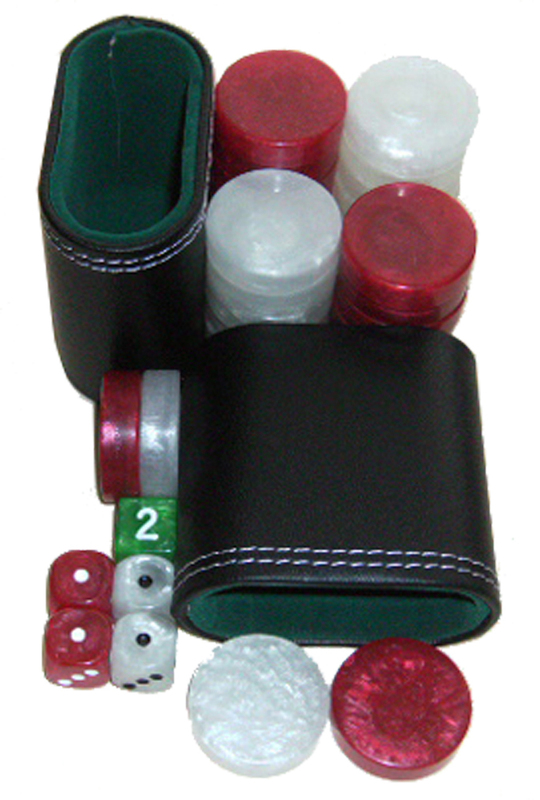 OR if you are building a backgammon set. Available in 3 sizes and assorted colours. 30 quality acrylic mother-of-pearl checkers (playing pieces). 2 Oval cups / shakers (with interior lip). 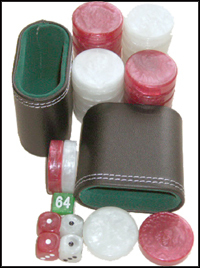 30 Acrylic, Mother-of-Pearl Checkers - 15 Red and 15 White: 39mm x 9.9mm (1.535 inch x 0.389 inch). 2 Oval Cups Black with Green interior: Height 70mm (2.75 inch). Oval 78mm x 39mm (3.07 inch x 1.535 inch). 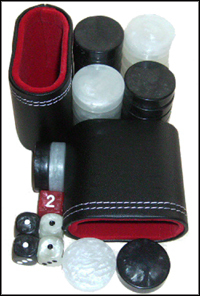 4 Standard Dice, Acrylic, Mother-of-Pearl - 2 red and 2 white. 15mm (0.6 inch). 1x Doubling Cube Green: 15mm. (0.6 inch). 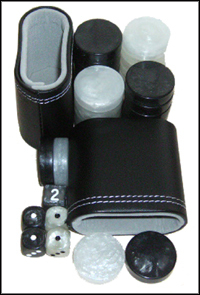 30 Acrylic, Mother-of-Pearl Checkers - 15 Black and 15 White: 34x 9.9mm (1.34x 0.389 inch). 2 Oval Cups Black with Red interior: Height 70mm (2.75 inch). Oval 78mm x 39mm (3.07 inch x 1.535 inch). 4 Standard Dice, Acrylic, Mother-of-Pearl - 2 black and 2 white. 15mm (0.6 inch). 1x Doubling Cube Red: 15mm. (0.6 inch). 2 Oval Cups Black with Grey interior: Height 70mm (2.75 inch). Oval 78mm x 39mm (3.07 inch x 1.535 inch). 1x Doubling Cube Black: 15mm. (0.6 inch). 30 Acrylic, Mother-of-Pearl Checkers - 15 Red and 15 White: 34x 9.9mm (1.34x 0.389 inch). 30 Acrylic, Mother-of-Pearl Checkers - 15 Black and 15 White: 28x 7.66mm (1.1x 0.302 inch). 30 Acrylic, Mother-of-Pearl Checkers - 15 Red and 15 White: 28x 7.66mm (1.1x 0.302 inch). 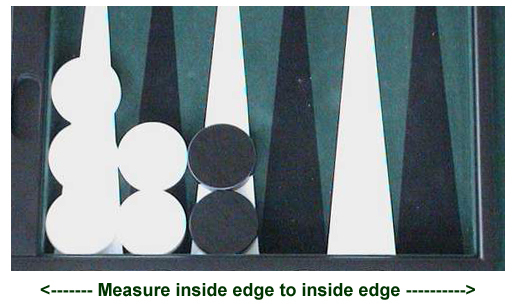 Measure along the inside edge - the edge where the base of the 6 triangles, measure from corner to corner, (i.e. from the edge of the middle bar to edge of playing surface). It is best to measure in millimetres, as this is more accurate, and divide this number by 6 to get the actual maximum size. Thus if this measurement is 258mm, then each checker can have a maximum diameter of 43mm (or 4.3cm).